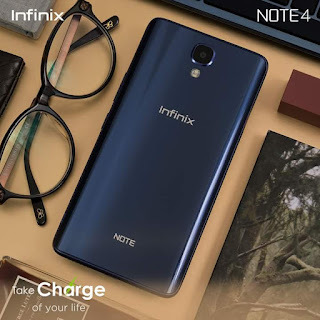 Infinix brand announces the release of their most anticipated smartphone this year 'Note 4 and Note 4 Pro' with a stylus 'Xpen'. 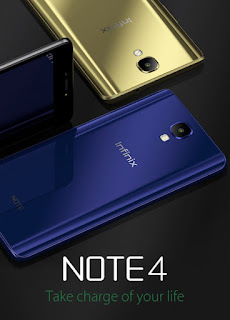 The Infinix Note 4 comes in a smooth and seamless design. It also has beauty and strength with a metal print back body that creates a thorough finish. NOTE4 has 5.7” display feature with color gamut - reaching 85% NTSC, With a 2.5D glass, metal print, 1300 (TBD) contrast rate and luminance, exceeding 500cd/m2. The 4300mAh large battery supported by XPower maximizes its stand-by time: 2 days for normal usage and 1.5 days for heavy usage. The NOTE4 has 13MP main camera and Dual LED flash and 1.4μm 8MP front camera. The Note4 is coupled with 16GB internal memory with 2GB Random Access Memory. The Note4 OS is powered with the new released XOS 2.2 based on Android Nougat 7. The Note4 has a fingerprint port at the backend for security. 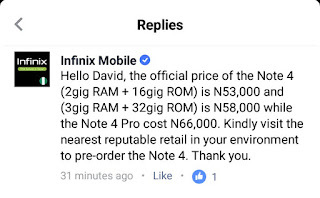 A customer asked for the price of Note4 on infinix facebook page and this was their replies. Note4 3GB Ram + Plus 32GB Rom is 58,000 Naira. Note4 Pro cost 66,000 Naira. Seems a nice android phone, I just want that it has enough space so that i can play no wifi games for android on my phone.